NewsGallery: CIAO BELLA'S CHOCOLATE JALAPENO GELATO: A FUSION MISTAKE? 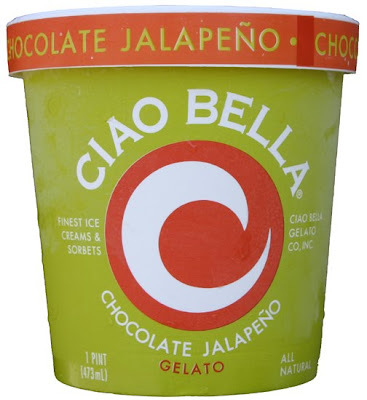 CIAO BELLA'S CHOCOLATE JALAPENO GELATO: A FUSION MISTAKE? Like any gelato lover, I can always rely on the brand Ciao Bella to give me just a hint of the real stuff they scoop up for you whenever one's lucky enough to be in Italy. So when I came across this flavor, naturally my curiosity got the best of me and so I decided to try it. Thinking back on it now, at the very least I thought "It's kind of an interesting concept." NOT. Warning: Do Not Try This at Home! It was so bad, my throat had an itchy reaction to the jalapeno after having a few spoon fulls. When you first dig into it, it seems harmless enough. What was before me was a pint of heaven. All I could taste was some pretty good chocolate gelato. That is up until I started to bite on actual bits of jalapeno. It suddenly became apparent that they were sprinkled all over and through out on what I once thought was a pint of paradise. Hence, the throat reaction. Needless to say I'll be sticking to my regular flavors from now on: Nocciola (hazelnut) and Baccio (chocolate with hazelnuts). P.S. I also tried the Passion Fruit Sorbet not so long ago, and ehh it's just OK.